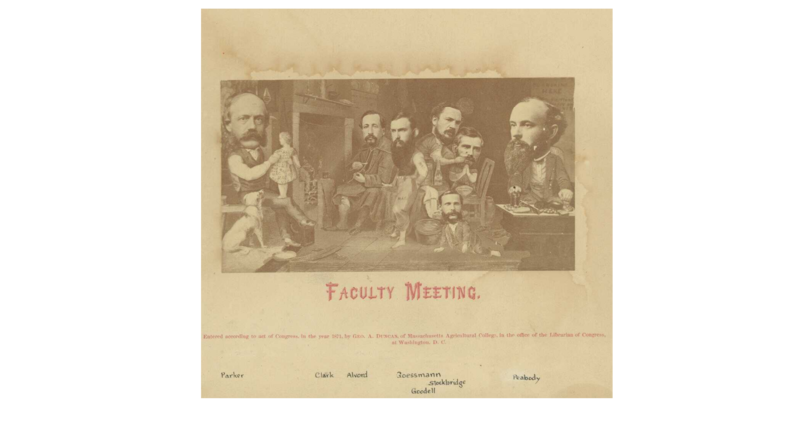 Novelty photo of founding faculty members of Massachusetts Agricultural College mounted on cardboard backing. Faculty members oversized photographed heads have been superimposed on caricature drawings of their bodies. "Faculty Meeting." and "Entered according to act of Congress, in the year 1871, by Geo. A. Duncan, of Massachusetts Agricultural College, in the office of the Librarian of Congress, at Washington, D.C." printed on front, under photo. Names of faculty in photo are listed on the front, and are from left to right: Parker, Clark, Alvord, Goessmann, Stockbridge, Goodell, Peabody. "J. Albert Robinson" and "Portraits - staff 1871", written on verso. Courtesy Special Collections and University Archives of the W.E.B. Du Bois Library at UMass Amherst.